I have been thinking about this design all week. Its been a busy week for me. So this morning I sat down and tried it out. 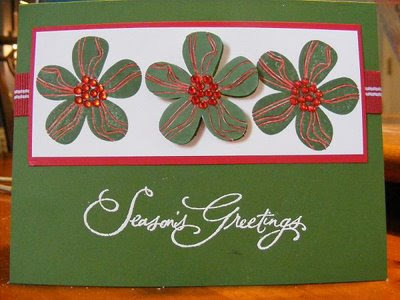 I used: Eastern Blooms stamp set, Glorious green ink and paper, real red and white whisperpaper . Red marker, red gems for the berries, Versamark, heat gun, white embossing powder. Stampin up ribbon. It was very easy to do.